News Update! Jackson County is once again revising the Floodplain Ordinance that regulates development activity in the floodplain. The proposed amendments will limit public notice and participation when development in the floodplain is proposed. Inappropriate development could jeopardize rivers, streams, riparian habitat and our health and safety. We could use your help to retain all our property rights to receive notice and be able to comment on development applications. Currently all floodplain applications are reviewed through the Type 2 process that requires notice to adjacent property owners, provides for a public comment period and allows local appeal of the decision. In 2011 Rogue Advocates successfully supported this Type 2 process in the current County ordinance. In order to streamline some development review the County is proposing Type 1 review that provides no notice to neighbors, no comment period and no local appeal. Under these new revisions, property owners adjacent to these developments in the floodplain that may be adversely impacted during high water events will not receive notice or be allowed to voice their concerns. Their substantial property rights to protect their health, safety, and property will be severely limited. The types of floodplain development activities that could be processed through this simplified process include excavation, grading, filling, mining, drilling, paving, substantial structural improvements or other land altering activities. We encourage oral or written public comment on these text amendments, LRP 2011-00008, that will be accepted by the Planning Commission at the hearing 9 a.m. March 22, 10 South Oakdale. Rogue Advocates has extensively reviewed these text amendments and specifically objects to two revisions proposed as 7.2.2(C)(1)(b) and (h). These two sections would allow development in the floodplain(not floodway) to be reviewed through the Type 1 process that the County reasons does not involve discretion. Rogue Advocates believes the County does use discretion in the decision process, but more importantly that adjacent property owners that may be adversely affected deserve the right to notice of the activity and the opportunity to comment. Rogue Advocates supports all the other text amendments proposed that allow de minimus development to be more simply reviewed through the Type 1 process. This includes support of 7.2.2(C)(1)(g) for fish enhancement projects(fish screens, habitat restoration) approved by ODFW. For more information contact Rogue Advocates. News Update! On March 30, 2011, the Jackson County Board of County Commissioners decided during its public hearing that it would require the Type 2 review process for development applications within the floodplain. This is a big win for both the aquatic environment and property owners living within the floodplain, which could both be harmed by floodplain development projects. Rogue Advocates is extremely pleased with the County's decision and thanks the Commissioners and the County for their patience and foresight in making this important decision. See press release here. Jackson County is currently in the process of updating its ordinance regulating development within the county's floodplain areas. National agency, FEMA, is requiring that it update its ordinance to meet its new standards. The county is required to amend its ordinance in order to continue participating in the National Flood Insurance Program, which provides discounted flood insurance to county residents. The county has fixed the problems that FEMA had with the ordinance, but there is still a lingering issue with the ordinance that needs to be fixed: It does not allow public input in the process of reviewing applications for development within the floodplain. 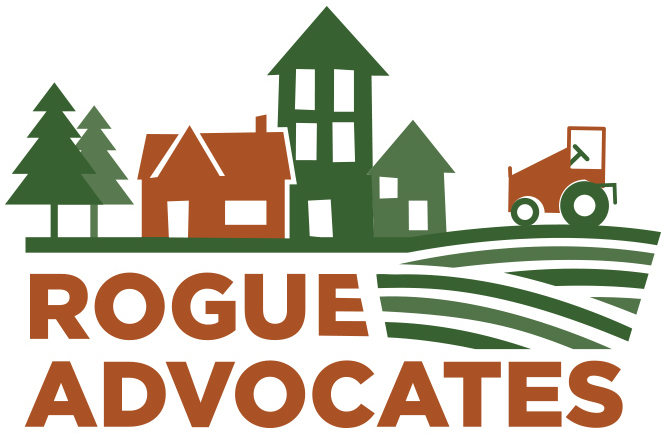 Rogue Advocates has been advocating during this whole process that the county require public input so that neighbors have the ability to know about and weigh in on the county's decisions to allow development right next to them. Development in floodplain areas can exacerbate the impacts of flooding and we believe neighbors have a right to know about potential harm to their property! The Board of County Commissioners will make their decision on March 16th. Please speak out in favor of public input, in this case called "Type 2 Review."